Termin: Bei Interesse an den neuen Terminen für 2015, bitte kurz email an uns und wir informieren euch unmittelbar, sobald diese feststehen ! Kosten: 780 Euro inkl. MwSt. Frühbucher/Ermäßigt: 680 Euro inkl. MwSt. Every human is a unique being with a specific movement profile. In this 12 days workshop the wide range of possibilities of expressive movement, personal movement patterns, communicative and social skills will be explored, clarified and deepened. Most of our communication happens on a non-verbal level and therefore it is of great importance that we know more about this, for instance how the use of personal space effects us or how the use of weight is influencing our social interaction. The way we are using and shaping our body and how we use effort and space is determining how we perceive the world around us and how the world around us perceives us and how we interact. Participants will have an opportunity to discover how personal habits of movement can help or hold back their actions. They will enrichen their personal movement skills and expressiveness. Analysing personal movement style is a way of self reflection and becoming more literate in movement will effect our bodily feeling, self confidence and self esteem. Enhanced self awareness may help improve insecurity and shyness en will improve communication and performance skills. The content of the workshop will focus on an in depth exploration of the wide range of movement possibilities that has been developed in Laban Movement Analysis. We will focus the use of Body, Space, Shape and Effort and its implications for personal movement patterns, communicative and social skills. In this intensive journey of practice, instruction/demonstration, discussion/reflection and observation participants will work on their own and others’ movement preferences. Laban Movement Analysis is the way and language for interpreting, describing, visualizing and notating all ways of human movement. Created by Rudolf Laban, and further developped by his students. LMA draws on his theories of Effort and Shape to describe, interprete and document how the human body moves. Used as a tool by dancers, actors, choreographers, art directors, athletes, physical and occupational therapists, it is one of the most widely used systems of human movement analysis. Laban Movement Analysis is an outgrowth of Laban’s theories that comprises movement into four categories: Body, Effort, Shape and Space. Irmgard Bartenieff created an organised basic approach for training functional expressive movement which is called Bartenieff Fundamentals, which is based on the principles of dynamic algnment, breath support, core support, initiation and sequencing, spatial intent, weight, effort and patterning. 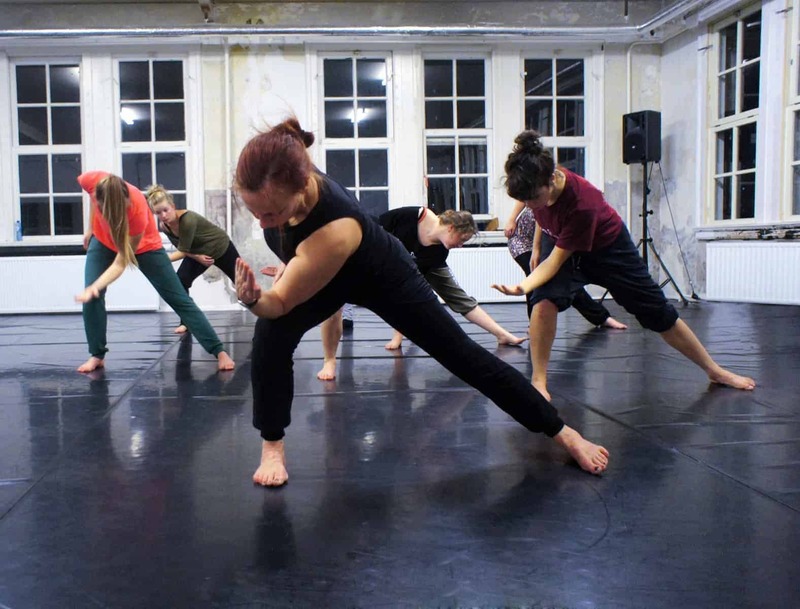 In this course we will use LMA, Bartenieff Fundamentals, but also Yoga, Modern Dance, improvisation & composition, contact improvisation, hands-on body work to enhance the above mentioned purpose. During the last three days we will also focus on performance skills and create a final presentation which will be shared with an audience. For further information about Joan van der Mast please click here. Teilnahmerücktritt: Bei Rücktritt per mail bis 14 Tage vor Workshopbeginn wird nur eine Stornogebühr von 30 % fällig, danach 50 %. Der restliche Betrag wird zurückerstattet. Bei kurzristigem Rücktritt wegen Krankheit ( mit Vorlage Krankschreibung ) und höherer Gewalt ( z.B. ausfallende Flüge ect. ) fällt nur die Stornogebühr von 30% an. Bei Rücktritt 1 Tag vor Beginn oder am Tage des Workshops ist eine Rückerstattung des Betrags nicht mehr möglich, es kann aber ein Ersatzteilnehmer/in gestellt werden.